Marcus Ulpius Nerva Traianus Augustus. 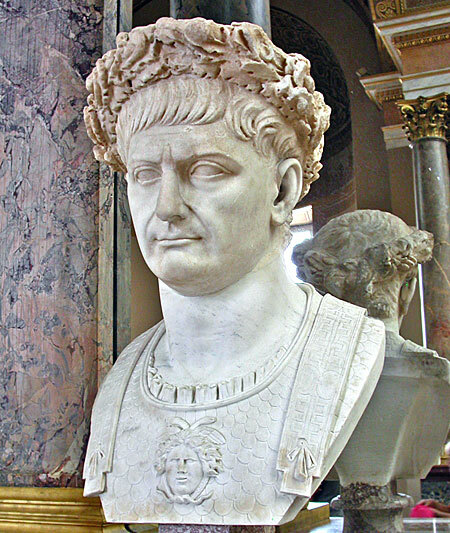 Born 18 September 53 died 9 August 117) Trajan was a Roman Emperor from 98 to 117 AD. Born into a non-patrician family in the province of Hispania Baetica, Trajan rose to prominence during the reign of emperor Domitian. Serving as a legatus legionis in Hispania Tarraconensis, in 89 Trajan supported the emperor against a revolt on the Rhine led by Antonius Saturninus. As a civilian administrator, Trajan is best known for his extensive public building program which reshaped the city of Rome and left multiple enduring landmarks such as Trajan's Forum, Trajan's Market and Trajan's Column. Early in his reign, he annexed the Nabataean kingdom, creating the province of Arabia Petraea. His conquest of Dacia enriched the empire greatly the new province possessed many valuable gold mines. As an emperor, Trajan's reputation has endured he is one of the few rulers whose reputation has survived nineteen centuries. Every new emperor after him was honored by the Senate with the wish felicior Augusto, melior Traiano ("[be] luckier than Augustus and better than Trajan"). Among medieval Christian theologians, Trajan was considered a virtuous pagan, while the 18th century historian Edward Gibbon popularized the notion of the Five Good Emperors, of which Trajan was the second.